As a break from my fav of all time, Jon Scieszka, I am introducing a historical fiction picture book, “Pappy’s Handkerchief.” By Devin Scillian and Chris Ellison. Don’t the author and illustrator names just scream American history? Themes: American History, American Pioneers, African-Americans, Oklahoma land run, Negroes. Resources: Teacher guides giving prereading questions, comprehension questions and discussion questions. http://www.gale.cengage.com/pdf/TeachersGuides/PappysGuide.pdf included are maps and discussion on what the American dream is. There is a lot more on there including show and tell feelings, math, word find and searches and more. This one is most conclusive. Oklahoma, where rumor has it there’s free farmland. The family sells all they own and head west to fulfill a lifelong dream. Their wagon journey, however, is plagued with troubles from ice storms and flooded rivers to diminishing supplies and sickness. Yet Moses and his family persevere. They arrive in time to take a place along the boundary line that marks the staging point for the Oklahoma Land Run. But after making it this far, will even more bad luck prevent them from realizing their dream of owning their own piece of America? This spellbinding story framed with evocative paintings sits alongside other equally poignant historical fiction in the Tales of Young Americans series from Sleeping Bear Press. narrated in first person. As I read to the end, racing along with Moses, the main character, to stake his claim in Oklahoma, my throat had a lump and I was hoping against all odds that he could do it. This story about one of our brave and courageous pioneer Black American families is historical fiction at its finest, telling a true story while imparting a history lesson. At the end of the story it is up to Moses, from who’s point of view the story is written, to save the claim the family came all this way and faced all those hardships for. recommended perfect picture books just click on the perfect picture book badge on the right. So do you think you would read it? 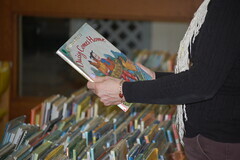 Do you like historical picture books or do you think the kids are too young to get the meaning of the book? This entry was posted in Clara Bowman-Jahn, Clarike Bowman-Jahn, Course or Book Review, social networking and tagged African American, Chris Ellison, Devin Scillian, Historical fiction, Jon Scieszka, Pappy's Handkerchief, Perfect Picture Book Friday, Picture book, Susanna Leonard Hill. Bookmark the permalink. Great choice – especially for older readers. I’m interested in getting this for my kids, as they are both learning about the west and settlement right now. Thanks for sharing! I agree—great choice andI’mpostingyour link on my FB fanpage as usual! Oh, this sounds great, Clar! I always love historical fiction and picture books for slightly older readers. Thanks for adding this one to our list – it looks really good and I will have to add it to my TBR list! Love historical fiction! And, this book sounds particularly engaging. And, I like NW Oklahoma. I think it’s important for kids to experience history through fiction. Reading facts are boring. But, a good story will have a great impact. Nice choice. I always enjoy historical fiction and would love this. Just out of interest, why do the author and illustrator’s names cry American history? My passion is writing historic PBs…thanks for introducing this one to us. Sounds like a winner…I will check it out at the library today! Clar, I always enjoy historical fiction recommendations. Thanks for this one! What a great book. – a history lesson with pictures!! I Facebooked, Twittered and GoogleX it. I also love historical fiction. This one looks very good. Thanks for sharing it with us. I really love books like this! I like historical fiction / non-fiction books, but it’s cool to find picture books that teach history. I think there should be more books like this! Thankyou Clar for bring this historical fiction to my attention. I must look it up. I love books like this to. I’m a speech therapist in a public school and stories that bring historical figures alive are always welcome. Right now I’m involved with some classrooms where we act out scenes from these kinds of books–kids love it!